Ribbon Roses look good on hair accessories and are very popular nowadays. These ribbon roses have been attached to hair pins to make beautiful hair pins for the coming festive season . 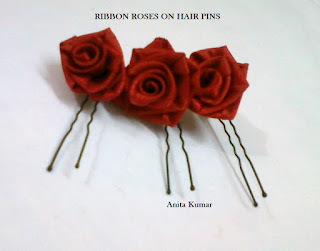 Ribbon and fabric roses are also used to enhance dresses and add instant glamour to any design. Checkout awesome ribbon flower tutorials on this site!